Around 10 days ago I flew back into Heathrow and joined the complaining crowds waiting for their turn to go through Passport Control. They obviously hadn't become accustomed to "Nepali time" as we had over the previous 6 weeks. Nepali Time is similar to "Student time" - if something needs to happen, it will, eventually (regardless of the deadline, or time frame given). Whilst time slowly ticked past in Kathmandu, we had little choice about our introduction to Nepali time. We soon discovered that promises involving time scales were in fact optimistic guesses in which "this morning" actually meant "today, if you're lucky" and "It's being taken care of right now" probably meant that the tea was being brewed. Nothing can be rushed in Kathmandu as we quickly came to realise. 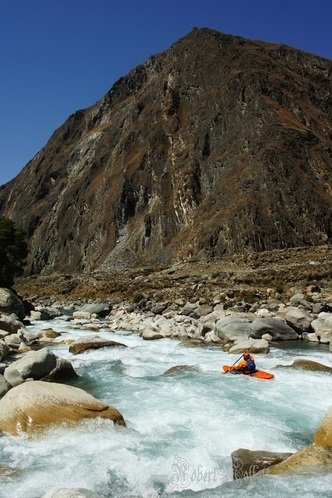 We were in Nepal with the aim of paddling the Thuli Beri river. Cutting through the tall imposing Himalaya of Western Nepal, the Thuli Beri is tucked away in the remote Dolpa region, accessible only by plane or by a week long trek over several 3000m+ passes. This remoteness means fewer tourists visit the area for trekking and as a result the required permits are harder to acquire. Trekkers may only enter the area with a guide, as we weren't trekking this didn't apply to us, but without an agency guide it's hard to get a permit. 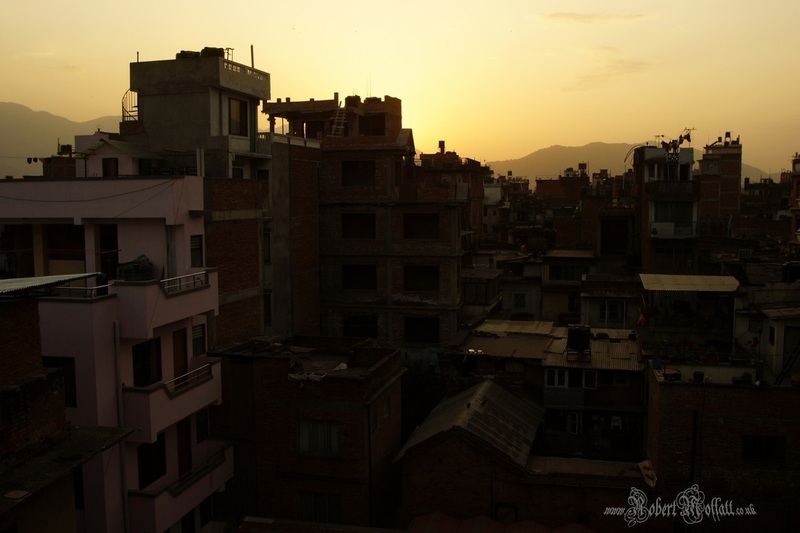 In short, we had slightly unusual needs and this combined with Nepali time meant we found ourselves sitting and waiting in Kathmandu for 6 days.Sitting and waiting in Kathmandu. Sitting and waiting in Kathmandu. After several false starts, we were a little sceptical when we were informed our tickets and permits would be ready one afternoon. As we sat in the agents office, patiently waiting "just 30 minutes more" for our tickets to arrive, our hopes began to fade. It looked like there was only one likely outcome - delaying our flight and waiting another day or two in Kathmandu - so it came as a shock when we were presented with tickets and permits just before closing time. Now that we had everything we needed the rush was on. 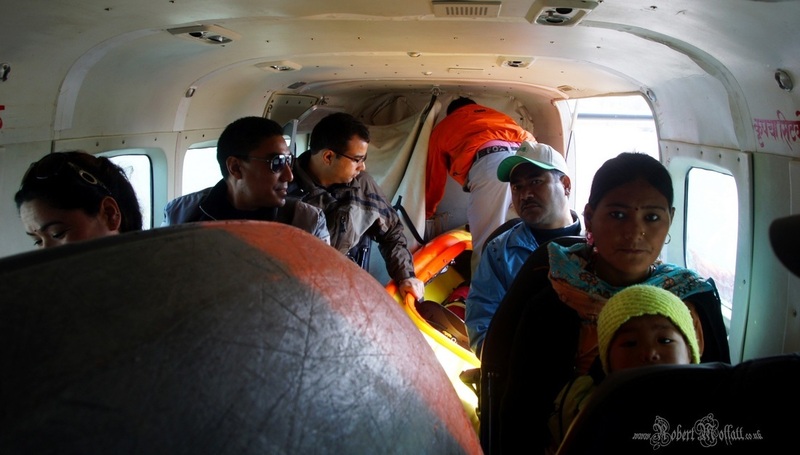 The flight left Nepalganj in less than 36 hours, and the buses to Nepalganj take between 12-18hrs. If we weren't on the night bus in less than 2 hrs time, chances were that we'd miss our flight and face the long, drawn out ordeal a second time. Fortunately we could still remember how to function on a timescale faster than Nepali time, rushing across Kathmandu to collect our kit, leave the unwanted bags behind and race to the bus park. Miraculously we made it onto the night bus with about 5 minutes to spare before it rocketed off onto the dark twisting mountain roads, our first hurdle was behind us. 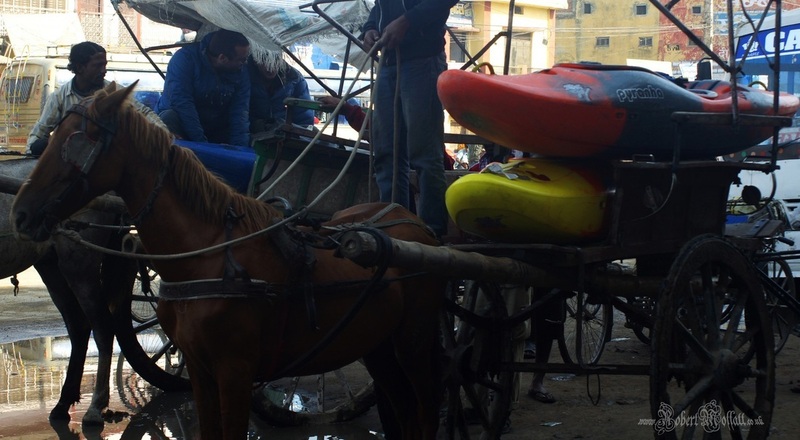 Loading the pony and cart in Nepalganj for the ride to a hotel and some much needed rest. Most who have paddled the Thuli Beri in the past have done so with a privately chartered plane. As a group of 3 this was never an affordable option, so taking our chances on a commercial flight and with just 10Kg of baggage allowance we knew we faced an uphill struggle to avoid being ripped off. After making our way to the airport on cycle-rickshaws (desperately praying that a passing bus didn't catch our kayaks which were wedged sideways across the rickshaw), we began a long session of bargaining with the airline staff. Eventually they realised that we weren't going to stump up the $1700 for a charter plane, and after both sides tried a few tricks to raise/lower the excess baggage charge we eventually squeezed onto an 8 seat Cessna, which just about had enough room for our kayaks. Our boats ready to be squeezed onto the small plane. The crew "pack" the aircraft ready for the flight. Having been instructed by the pilot to hold onto the boats during take off and landing we quickly climbed up into the haze that clings to the northernmost limit of the Indian plains before the monsoon. 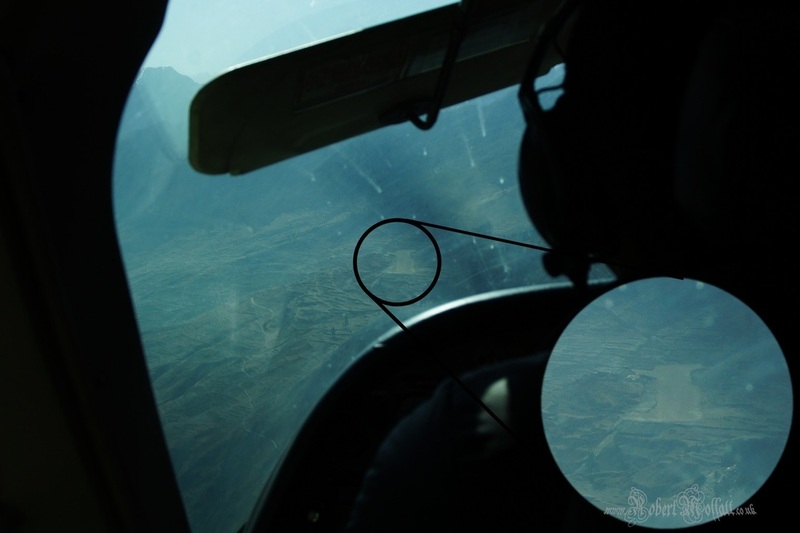 Soon, the mountains began to appear and loom over the small aircraft and for the first time we began to see just how remote and unforgiving the landscape we were entering could be. Soon we were treated to our first views of the river as the aircraft approached the landing strip, but we didn't have long to admire them as we set eyes on where we would be landing. 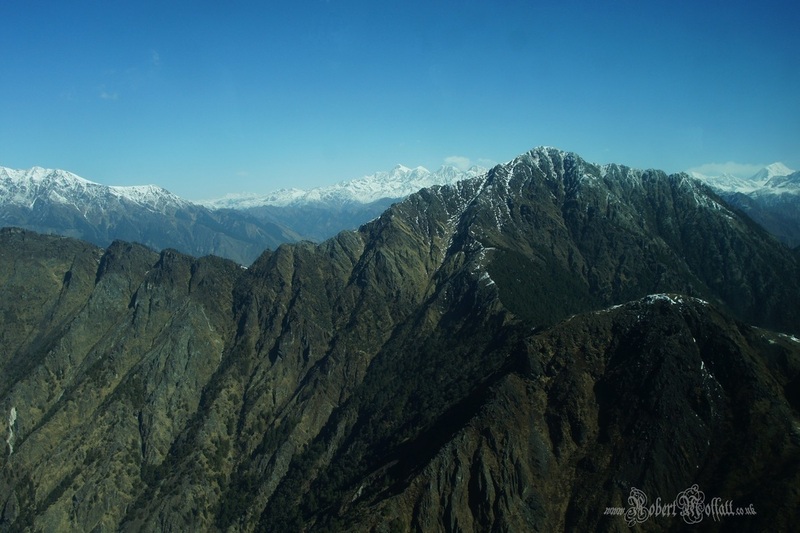 Carved out of the mountainside, seemingly incredibly short and steep, the prospect of landing on the "runway" left us sitting rather uncomfortably behind the pilots as they completed their pre-landing checks (a few prayers) and began the descent into the mountainside. Flying into the river between the mighty peaks that dominate the region. The view through the cockpit with (inset) the runway perched precariously on the mountainside. Despite our greatest fears, we landed safely and were soon stood between the few buildings that constitute the village of Juphal. 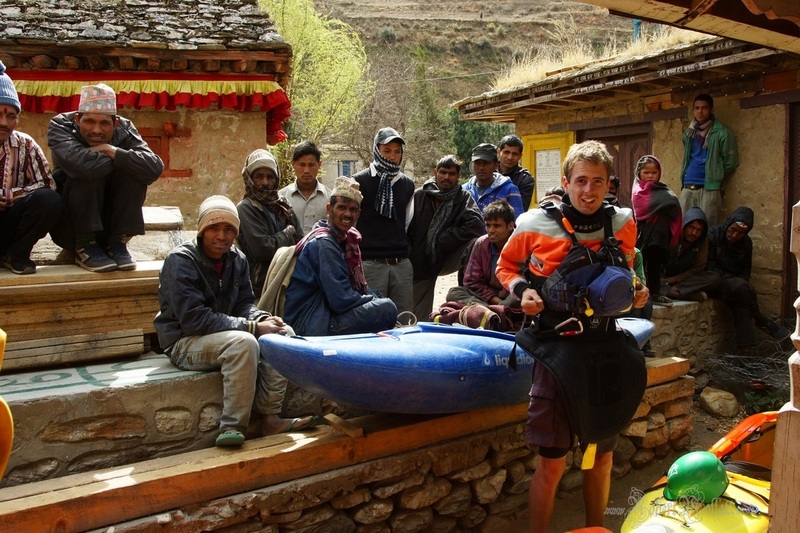 From Juphal we hired porters to carry the boats to Dunai, the next town up the river, where we hoped we could continue up to above the first gorge section. Unfortunately we were running out of daylight, so instead opted to just put on in Dunai and drift out of town until we could find a suitable campsite for the night. Andy kitting up in Dunai, eager to make a start. After a week of falling victim to the endless faff induced by Nepali time, we were finally on the Thuli Beri. 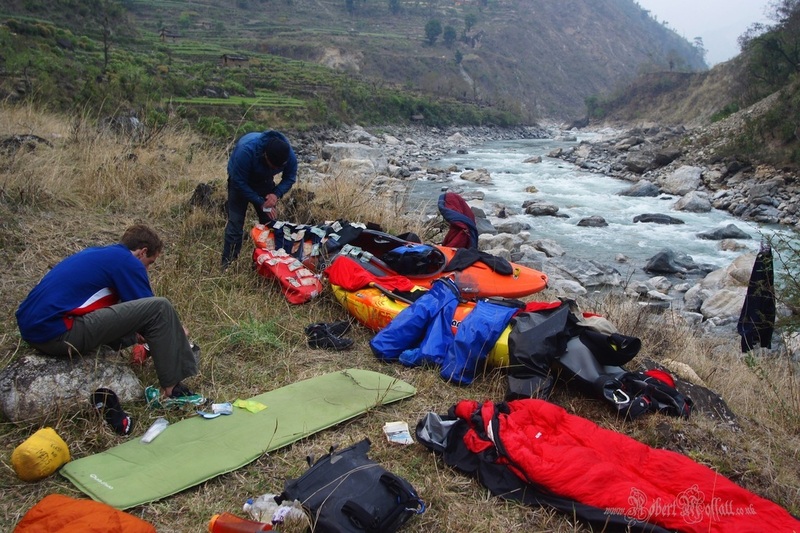 As we slid into our bivvy bags, we were all contemplating what lay in store for us: was the river level right; did we have enough food; would we work well as a team? Waking up to the sound of the river punctuated by the occasional clang of bells as donkey trains moved up and down the track came as a welcome change from the hustle and bustle that we'd grown accustomed to in Kathmandu. Here, surrounded by the beautiful mountains that rose up all around us, we were able to dictate the pace of life for the first time - gradually getting ready for our first real day on the water. From Dunai, the river is mostly grade II for a few km. Drifting along past fields and groups of local people transporting crops up and down the valley, the landscape opens up, allowing you a few moments to enjoy and savour the scenery. Before long, a monastery high on a cliff to the right marks an increase in gradient and the start of the harder rapids. Andy enjoying one of the first steeper sections after passing the monastery. We were soon into continuous grade IV rapids, quickly back into the routine of picking apart rapids and only occasionally being forced out of our boats to scout. A few km below the monastery the river becomes more enclosed as the mountains become steeper and cliffs begin to line the river, this is the Golden Canyon - 10km of continuous grade IV and IV+ rapids. From here, my memory has become a haze of fantastic rapids with great little moves, big holes and a few challenging lines to make. As we were nearing the end of the Canyon we all began to feel the effects of just how tiring our first real day of paddling had been - the elevation may only be around 2000m, but several hours of continuous grade IV/IV+ had left us spent. Each stroke now felt like we were moving a large ship rather than a kayak, and we were beginning to crave our luxury dried noodle dinner. George, shortly before entering the Golden Canyon. The Thuli Beri is the most consistently continuous river I've ever paddled, which became apparent as we left the Golden Canyon and continued to find fantastic bouldery grade IV/IV+ rapids. The steep, bouldery rapids continue for kilometre after kilometre as many shorter gorges come and go. By now we were unsure of how far we had come, and with a long portage ahead of us we hoped we wouldn't find it towards the end of a day when we might be forced to camp near a town. Fortunately for us, we hadn't covered as much ground as we thought, and found ourselves camping on an isolated grassy spot at the base of a cliff. We soon became uneasy in our tranquil spot as rocks periodically bounced down around us from the cliff above, hitting the ground with frightening force and shattering. Since it was too late to move we all sought shelter under protective ledges or large boulders, enduring a restless night and waking up uneasily with every thud throughout the night. 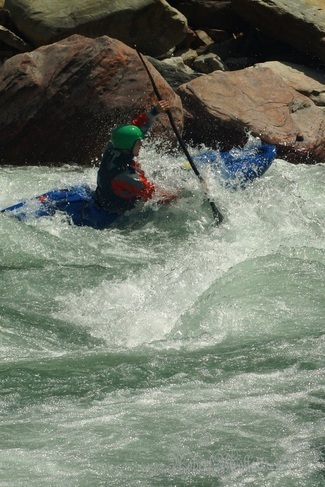 George lining up to punch a large hole in one of the harder rapids after the Golden Canyon. Fortunately all the rocks missed during the night, and we woke up ready to press on and get past the big portage. A few hours of paddling later and we approached the town and suspension bridge that marks the portage - here the river enters a 3km long section of 5/5+(6), most of which has been run, but which would have undoubtedly taken us all day to paddle and portage at river level. The track starts off right by the river though, so walking the whole section seemed the sensible solution. Unfortunately Georges bartering skills are somewhat lacking, and after a few minutes of unsuccessful bargaining with a group of potential porters, George shouldered his boat and walked off, leaving us to follow. After the first kilometre we were cursing the mistake. After the second we had promised not to let George lead any negotiations again, and quickly accepted an offer of porters for the remaining kilometre back down to the river. By the time we had scrambled down to river level, quite a crowd had gathered on the bridge and along the trail, and our hopes of having a quiet snack to regain some energy vanished. Pressing on, with dangerously low energy levels we encountered some of the hardest paddling yet, and after 10 minutes of running drops blindly with a poke-and-hope attitude we realised that we had to stop for a snack, whether we were being watched by the entire village or not. 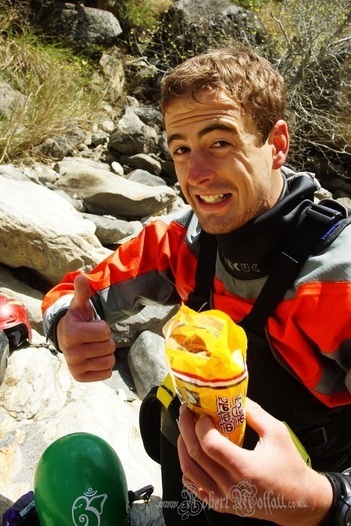 Andy tucking into a packet of biscuits. Sugar reserves replenished, we pressed on. We were all exhausted after the exertion of the portage, but had to cover another few kilometres to avoid camping too close to the town. Fortunately the river eased slightly, allowing us to push on around a few corners until we found a suitable ledge high above the river which looked perfect, but then shattered as we were anything would have looked like the Hilton Hotel. Despite feeling a complete sense of isolation and finding a camp site where you can't possibly be found by the locals, within 30 minutes of stopping for the night there will invariably be a crowd of young children gathered, curiously inspecting the newly arrived freaks. Our ledge was no different, and we were soon surrounded by inquisitive children eager to play with our kit. The local children imitating the newly arrived freaks. After waking up to find the same group of small children watching us, we packed and beat a hasty retreat to the solitude of the river. Some of the hardest rapids on the Thuli Beri lie below the long Awulgurta portage (unless of course you paddle the Awulgurta section), and after setting off on what we anticipated may be our last day, we were soon forced out to inspect a handful of rapids. A few kilometres later, the river began to narrow and we found ourselves in a gorge faced with a series of challenging rapids and the occasional sieve requiring a portage. 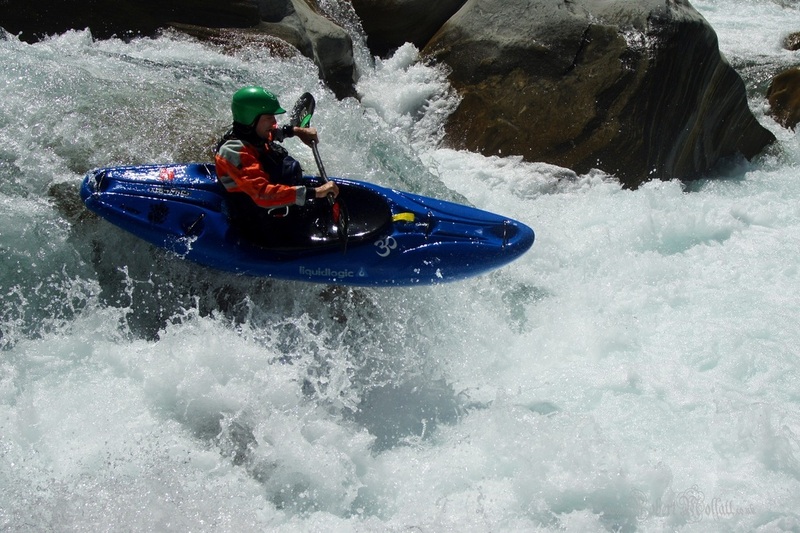 Once out of the gorge, the whitewater continued, never easing to below grade 4. Andy in one of the harder rapids below the Awulgurta portage. As the rapids kept coming, we kept going. Unsure of how much ground we were covering, we relished each rapid we came up against, and with the exception of a boulder choke, there were no more portages. The river was now continuous IV/IV+, with very little let up between the harder sections. We pressed on, savouring the quality of the rapids, only pausing long enough to find lines in the harder rapids. After a few hours the river began to ease, gradually becoming continuous III rather than IV/IV+ and we came across more buildings and eventually a village. Andy revelling in the continuous IV/IV+ whitewater. The river, however, held one final surprise as it dropped into one last short gorge. After several kilometres of easier whitewater we had begun to wind down, switching our minds off and thinking instead about congratulating ourselves on finishing the Thuli Beri. We were quickly reminded of the power of the river, as we made our way through the final rapids in a somewhat less than stylish manner! Now, we really could relax and enjoy our surroundings, the river eased to grade III once more, and we soon found a lovely grassy terrace to camp on. Our final campsite on the Thuli Beri. George dries his wadge of cash after letting it get slightly wet during the day. All that remained was the paddle out. We were soon at the confluence with the Sani Beri, and making our way down the 58km of flat and occasional grade II rapid to Devisthal. From here there is a bus out to the main road, but unfortunately for us we believed the guidebook ("The Beri improves greatly below here") and opted to paddle out the remaining 140km. Sadly the Beri didn't improve greatly, we didn't find any fantastic grade III whitewater, and nor did we come across any spectacular gorges. Instead we endured 3 long days of flat water, paddling past communities washing their babies arses on the beaches. 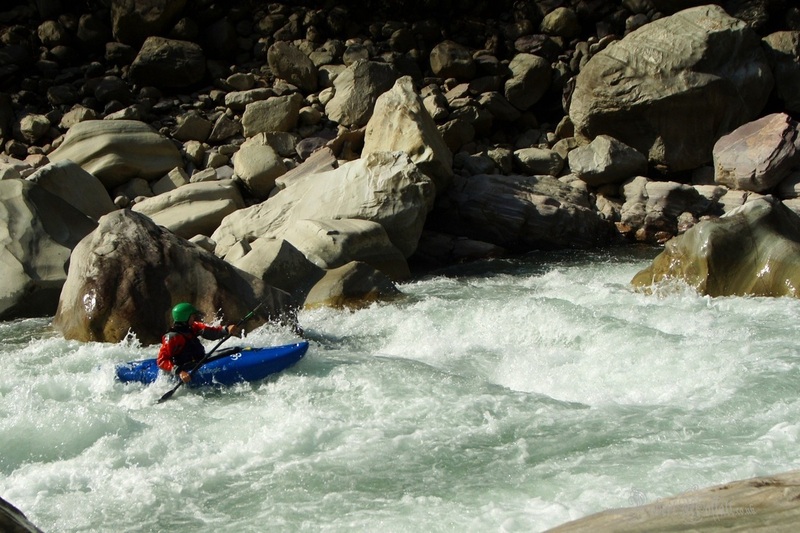 Fortunately this didn't detract from just how incredible our 4 days on the Thuli Beri had been - it truly is a fantastic run, in a spectacular setting with world class whitewater. 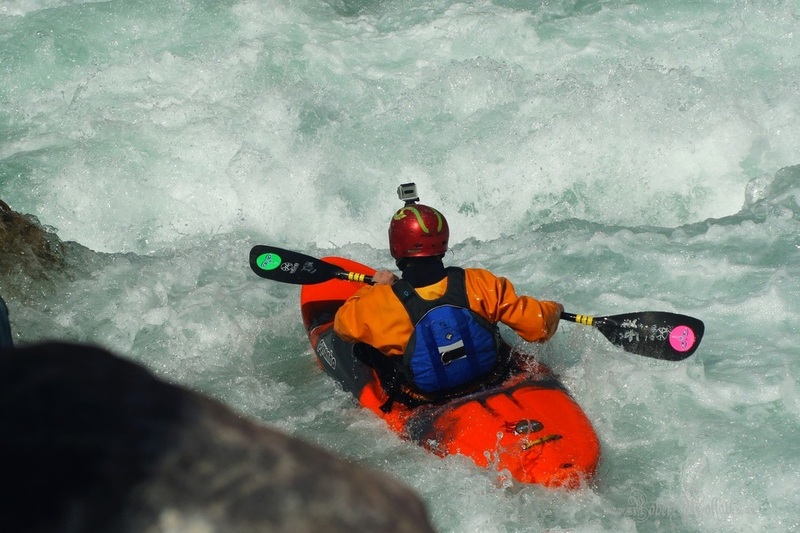 A must for any whitewater paddler.